Eye-catching presentation and a certain fun factor are keys to helping kids (and grown-ups!) eat healthy. Check out how using cookie cutters, putting food on a stick, & blending fruits or salad greens into a smoothie, parfait, or sorbet changes the whole game and gets kids wanting fruits and veggies instead of junk. 1. Put it on a stick! I don't know why food is so much more appealing to kids - and even some grown ups - when it's served on a stick! I grew up in Minnesota and our state fair is notorious for foods served on a stick. Why not? Use sticks found in baking areas of craft stores that are typically used for making lollipops and cake pops, bamboo skewers, or popsicles sticks. 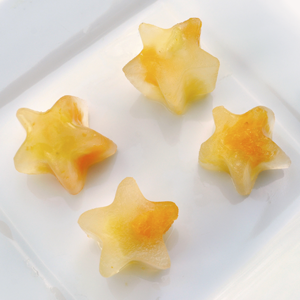 A basic set of cookie cutters makes food presentation fun. I used a small circle to create pineapple gold "coins" seen right, and a heart to punch shapes out of watermelon, above right. Like the green and white polka dot cups (above right) , I use fun containers whenever possible. 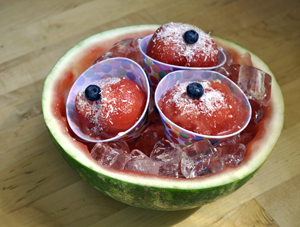 Try snow cone cups with a giant scoop of watermelon inside. The white sprinkles are coconut flakes with a blueberry on top - even the hollowed out watermelon is a container for the snowcones! Right, orange cups contain a summer smoothie. Click here for smoothie recipe. Watermelon purees easily into a delicious and super-colorful drink. Add ice if you like it colder. 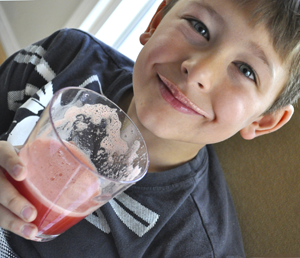 Sometimes, transforming fruit into a drink or smoothie is enough to make kids try it. 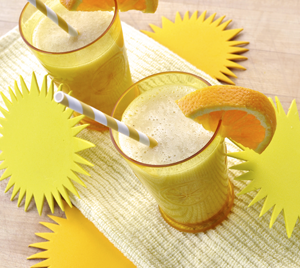 As a bonus, you can disguise other fruits or even salad greens, in a smoothie that they normally wouldn't touch. 5. Make a Frozen Treat! Popsicle molds are great to have on hand and can turn a leftover smoothie into a frozen treat. Try ice cube trays in different shapes as well. Pop frozen cubes out into a bowl and serve as a dessert, or add the fruit cubes into a glass of apple cider, lemonade, or other juice clear enough so you can see them floating in the glass. Click here for frozen treat recipes. Click here for pudding recipe. Would you believe the chocolate pudding on the left has NO dairy or white sugar? It's whipped avocado people - AVOCADO! And kids will never know. 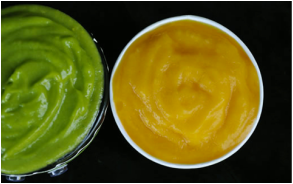 On the right, the orange colored sorbet is pureed mango. The green color is achieved by adding fresh spinach or kale leaves to the mango puree. I promise you, your kids will never know. Try it yourself! 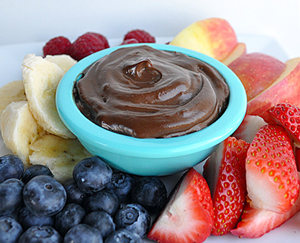 Eating this way is far better than dieting, hands down! Click here for sorbet recipes. 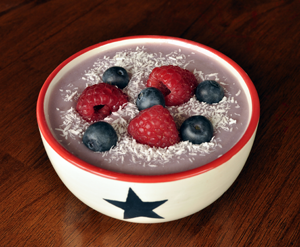 Let kids assemble their own variety of fruits, yogurt, nuts, coconut flakes, or granola. I like SO Delicious brand coconut milk yogurts ~ they're a great alternative for the dairy & lactose intolerant. 8. Make It & Accessible & Convenient! When I have fruit set out in a bowl, or washed up and plated, veggies sticks already cut along with convenient organic single serve packs of hummus all set to go - my kids will munch to their hearts content. I'll often make and encourage them to try salad as well. When we're set up for success, we are getting maximum nutrients and fiber - and no one is asking for junk! It's fantastic! For my son's 3rd birthday, we had a jungle party. We made banana shakes and served the treats seen on the left. Signs indicated the food adventures available to party guests. 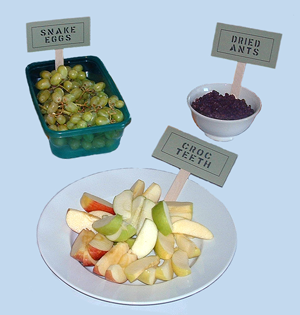 Green grapes were "snake eggs", raisins were "dried ants", apples were "crocodile teeth". Apple slices served with nut butter and granola for dipping is a filling and nutritious breakfast or snack. Simply cut the top off an apple and hollow it out with a melon baller. 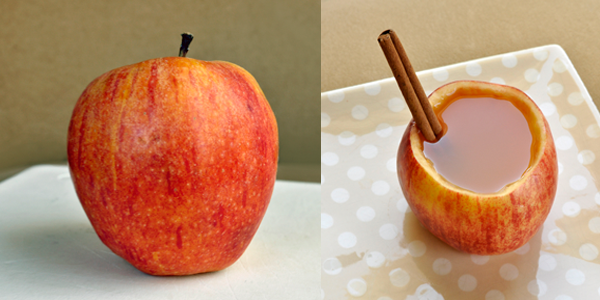 Fill the "cup" with apple juice! A cinnamon stick makes a fun straw.